Preethi is someone at Big Fish that you can thank when your software works as it should. As a Quality Assurance (QA) Engineer, she anticipates anything and everything that could go wrong, and ensures it doesn’t. Technically speaking, she creates and executes the test plans for our clients’ software projects. If a bug is found, or something isn’t working as it was designed, Preethi catches it so it’s fixed before it winds up in production. While some might turn up their nose at fault finders, we say “bring it on!”. 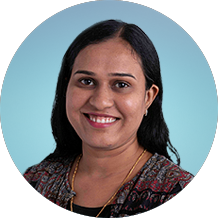 Preethi has a Bachelor’s Degree in Engineering and a diploma in software testing. She has a true passion for quality assurance and considers it an honor to be part of delivering software that functions as it should for our clients. When she’s not at work, Preethi loves to read biographies, cook up new creations in her kitchen in New Jersey, and travel with her family.